For all model and part information on IFC Butterfly Valves, please view our pdf catalog HERE . Seat is non-compressed as disc approaches. Disc is closed with no line pressure. Disc in closed position; Line pressure applied from left side. Disc in closed position; Line pressure applied from right side. As the seat cross section is bellow shaped,line pressure exerts an upwards force on the seat independent of which side of the seat is under high pressure. This action forces the seat against the disc. Increased line pressure causes tighter sealing, thus ensuring bubble tight sealing at all differential pressures. As system differential pressure increases the seat-disc interface proportionally tightens to maintain an effective seal. The IFC Butterfly Valves seat assembly is locked and slightly compressed in the body recess by a full-faced seat retainer, thus ensuring the seat is secure regardless of the disc position. The IFC Butterfly Valves seat is self adjusting to temperature changes and wear. The full face seat retainer is held in place by a circumferential snap spring constructed from Inconel. Unlike competitive designs that use bolts to retain the seat and seat retainer, the IFC design results in “ZERO” interruption across the full gasket seating surface. Since no special tools are required for the removal of the seat retainer, seat replacement is extremely easy. Remove the seat retainer by rotating it counter-clockwise, rotate the disc into the closed position and place a new seat into the seat chamber machined into the valve body. 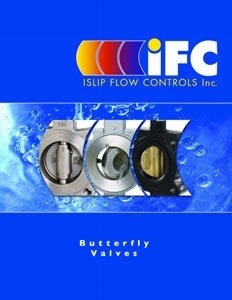 Request a quote on IFC Filters including IFC Butterfly Valves. *Advanced Filtration values your time and privacy. We will never send more then 1 email/week and will never give your information away without your permission. For technical information on any of these models view our catalog here. Expert consultation and competitively priced filters. Advanced Filtration ships throughout the world and offers on site support and service to the New York and Philadelphia metro areas including all of New Jersey, eastern Pennsylvania, southwestern Connecticut and southern New York State.